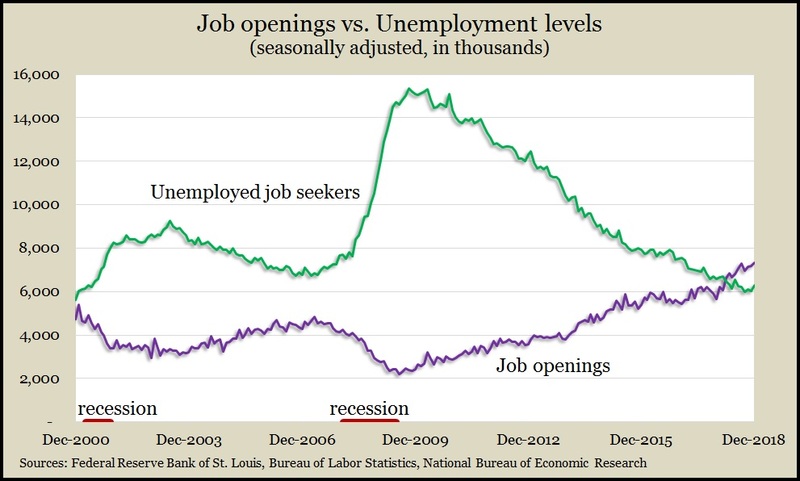 U.S. employers had a record 7.3 million job openings at the end of December. The Bureau of Labor Statistics reported that openings continue to outnumber job seekers, which had never happened before March 2018. Unmet demand for workers should raise wages and encourage more consumer spending, which drives about 70% of economic growth. The broadest measure of inflation remained unchanged in January for the third month in a row. The Consumer Price Index didn’t budge, the Bureau of Labor Statistics reported, as energy costs fell, led by a 5.5% drop in gasoline prices. Excluding food and energy items, the CPI rose 0.2% for the fourth month in a row. The broader index grew 1.6% from January 2018, the lowest increase since June 2017. Excluding food and energy, core prices rose 2.2% in the latest 12 months – unchanged from December and February inflation rates, and in line with the Federal Reserve’s longstanding inflation target. The four-week moving average for initial unemployment claims rose for the third week in a row, reaching the highest level in 13 months. But the Labor Department indicator was 34% below the 52-year average, suggesting employers continue to be reluctant to let workers go. That should sustain demand for workers and higher wages, which should fuel consumer confidence to spend more. A key measure of consumer spending – retail sales – unexpectedly declined 1.2% in December, the biggest drop since September 2009. The Commerce Department said that 11 of 13 retail categories had lower sales in December with only car dealers and building centers gaining from November. Lower gasoline prices accounted for about one-fourth of the pullback in sales overall. Year-to-year, retail sales rose 2.3%, the lowest since August 2016 and about half the long-term average of 4.3%. Business inventories drew down by 0.1% in November following a strong 0.6% gain in October, according to a separate Commerce Department report. Sales declined by 0.3%, suggesting that demand is dropping faster than supply. The inventories-to-sales ratio – an indicator of how leanly businesses are operating – remained at a level last seen in late 2014 and at the end of the Great Recession. Year-to-year, inventories rose 4.6% while sales rose 4.2%. Wholesale inflation, measured by the Producer Price Index, fell 0.1% in January, according to the Bureau of Labor Statistics. Energy prices fell 3.8%, down for the third month in a row and the fifth time in seven months. Excluding volatile prices for energy, food and trade services, the so-called core PPI gained 0.2% for month, as analysts expected. Year-to-year, wholesale inflation rose 2%, the lowest in more than a year. Core PPI rose 2.5% from Jan. 2018, the lowest in 12 months. The Federal Reserve reported that industrial production declined 0.6% in January, held back by a 0.9% dip in manufacturing output. It marked the first setback in three months for manufacturing, which accounts for about three-fourths of U.S. industrial production. Auto making led the decline, but manufacturing of business equipment also fell. The year-to-year comparisons were more encouraging with a 3.8% increase in production from January 2018. Capacity utilization shrank to 78.2%, the lowest since July. Utilization has not exceeded the long-term average of 79.8% in almost 11 years, suggesting inflationary pressure is not an imminent threat. The University of Michigan’s preliminary February consumer sentiment index rose from January, a sign that Americans are recovering from the 35-day partial federal government shutdown. An economist affiliated with the report said as a result of the Federal Reserve’s apparent pause in raising interest rates, consumers have the lowest expectation of inflation in 50 years of surveys. Based on the report, the economist forecast a 2.7% rise in consumer spending in 2019, vs. 2.2% growth in the overall economy.